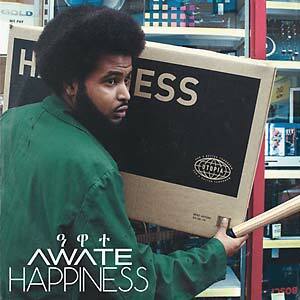 With infectious melodies and razor sharp bars, rapper AWATE flows over psychedelic funk by producer Turkish on debut album Happiness. The rapper, producer, and MOBO supported artist weaves together stories from Maiden Lane Estate in Camden and his refugee experience to build on his reputation as one of London's most visionary artistic forces. Happiness was written and recorded on bail over a two-year period while AWATE was on bail for four cases which he was eventually cleared. Honing his craft from the age of 12, he made a name for himself at the legendary hip-hop spot, Deal Real at the age of 15. AWATE learned from mentors such as Poisonous Poets rappers, Stylah and Lowkey, BBC 1Xtra's DJ Semtex and one of his heroes, Yasiin Bey. As a refugee from Eritrea via Saudi Arabia, AWATE's lyrics are a complex train of thought on subjects like self-esteem, racism, pride, and class. Building a reputation as an electrifying and engaging live performer, AWATE has toured worldwide with Lowkey since 2010 and has supported the likes of Jay Electronica, Ghetts, Big Daddy Kane, and Blackstar (Mos Def and Talib Kweli). He has also headlined and performed regularly at The Roundhouse as a resident artist at the iconic venue. AWATE's long-awaited first release, 2016's Shine Ancient EP was premiered on Complex with features on Noisey, Huck, AFROPUNK, OkayAfrica, and premieres on BBC 6 Music with Gilles Peterson, Jamie Kennedy on Radio X as well as support from DJ MK and Shortee Blitz on KISS. RIYL: Chris Franck, Turkish.